From now on all replays of Tic Tac Trance are also available at Mixcloud.com/TicTacTrance! With a mixture of melodic and progressive tunes I’ll open Tic Tac Trance #026 on February 13 @ Party107.com! Furthermore I’m glad that I’m able to give you an exclusive preview of Dresden & Johnston’s forthcoming single “Keep Faith”. 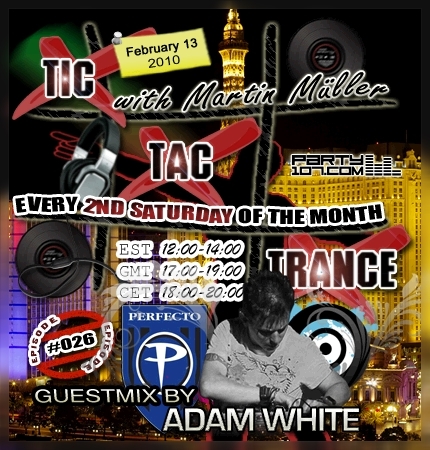 For the second half my guest Adam White will promote his new artist album “Perfecto presents Adam White” with his energetic 30 minutes guestmix! Later in this show I’ll also present you two exclusive new intro & outro edits I made especially for bringing this episode to it’s deserved ending. My show will air on February 13 at 18 CET / 17 GMT / 12 EST. Check out your local time HERE!